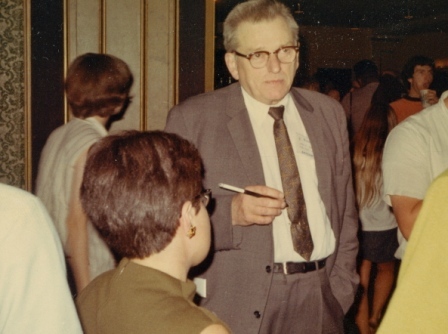 John W. Campbell, Jr. at BayCon in 1968. Photo by Bill Warren. Born June 8, 1910: John W. Campbell, Jr.
Editor of Astounding/Analog Science Fiction from 1937 until his death in 1971, John W. Campbell, Jr. is among those credited with bringing about the Golden Age of Science Fiction of the 1940s. He courted controversy and is still embroiled in it to this day, thanks to the latest Robert A. Heinlein biographies reminding fans about the Dean of Science Fiction’s tense relationship with his early patron, and how his unhappiness with Campbell’s editing and voluminous feedback made him quit submitting stories to Astounding altogether. Yet other writers found it possible to both quarrel with and adore the man. Harry Harrison was an unabashed liberal. In these polarized times his virtual father-son relationship with Campbell is almost unfathomable given their irreconcilable political views. Yet it was Harrison who edited John W. Campbell: Collected Editorials from Analog, two volumes of The Astounding-Analog Reader, and The John W. Campbell Memorial Anthology. There are innumerable legends about Campbell. The best-known is that in 1944 Cleve Cartmill’s atomic bomb story “Deadline” resulted in a visit by a War Department investigator to Astounding’s editor. Few remember that Cartmill’s story was actually the culmination of Campbell’s long flirtation with atomic weapons in the pages of his magazine. Another Campbell legend was instigated by a letter Richard A. Hoen sent to Astounding in 1948. Hoen, in a famous bout of wishful thinking, purported to review ahead of time a 1949 issue of Astounding Science Fiction with stories by Don A. Stuart (Campbell’s pen-name), Anson MacDonald (Heinlein’s pen-name), Lester Del Rey, A. E. Van Vogt, L. Sprague DeCamp and Theodore Sturgeon, and fact articles by Willy Ley and astronomer R. S. Richardson. Campbell ran Hoen’s letter in the November 1948 issue of Astounding and laughed it off, saying “Hm-m-m — he must be off on another time-track.” But his reaction behind the scenes was something else entirely. He went to work contacting the writers and acquired all the stories required to fulfill Hoen’s prophecy in the following November’s issue. (See full details in Andrew May’s analysis of the issue, “Science Fiction Prophecy.”.) Even Heinlein, who had stopped sending stories to Campbell, cooperated in fulfilling the vision. How ever did you find a shot of him in a suit. Every time I saw him he was wearing a loud Hawaiian Shirt! I’ve got about 453 copies of the November 1949 Astounding Science Fiction on microfiche that come from Howard DeVore’s stock of the promotional materials that were used when ASF, Unknown, and FandSF were put on microfiche and briefly sold back in the early 1980’s. I’ve been looking for a way to get rid of them without throwing them out. If you want a free copy, send a stamped, self addressed envelope to ASF Prophecy Issue, 502 Spartan Avenue, East Lansing, MI. 48823. Even if you don’t have a microfiche reader, a local library or university library near you probably would, and if you want an extra copy to donate to a library, just say so; like I said, I’ve got 453 of these. (I’ve also got a very few microfiche first issues of Unknown (1939) and FandSF(1949) for those who respond first.) – Keith K.
The only time I met John W. Campbell, he tried to engage me into an argument, as to the classification of “Meihem In Ce Klasrum” by Dolton Edwards was a short story or not. Hr was rambling on about simplified spellings for English and was going to reprint that “story”. I kind of said it really wasn’t a story, but a fictional article. Campbell assured me, looking me clearly in the eyes, that it had characters and it was a story. I refused to take it any further. “The Moon is Hell” was not found in that collection, though I thought it was pretty good.